Dennis R. Bourret has directed Tucson Junior Strings since 1970. He received his Bachelor of Music and Master of Music degree in performance from Colorado University, and a BME from Denver University. He has conducted All-State, Regional Orchestras and All-City and Festival Orchestras in Nevada, Idaho, Kansas and Arizona. 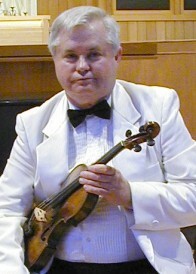 He has been principal violinist and violist of the Tucson Symphony, Arizona Opera, and Tucson Pops Orchestra. He has been guest conductor for the Southern Arizona Symphony and was a founding member of the piano quartet, Cremona Collage which traveled to Sao Paulo, Brazil for a performance tour in June 1995. Currently he is affiliated with Ensemble Gaudeamus which initiated the Big Horns Chamber Music Festival in Sheridan, Wyoming in 2000.